Siam Kyudo Kai: A great support from NIPPON STEEL & SUMIKIN Kyudo Club! A great support from NIPPON STEEL & SUMIKIN Kyudo Club! 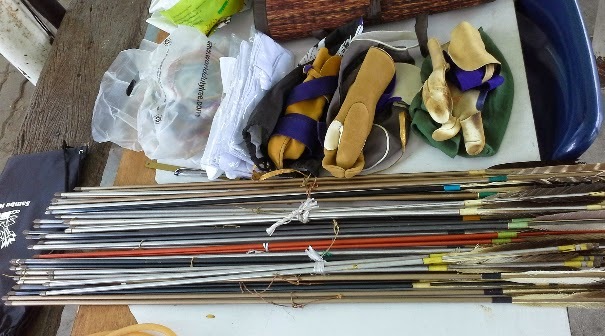 Noda-san has brought us lots of Kyudo equipment to be used and shared for training purpose. we now have several sets of ya, shitakake, tsuru and 3 kake for membership use. This bring us smile, and joy. Gay and Ya, our beginner members, had the first time experienced wearing kake and practicing subiki with it. They have moved into another step of Kyudo training. As a representative of Siam Kyudo Kai, I would like to express our sincere gratitude to Mr. Morimoto, Mr. Miyazaki, Noda-san and every member of NIPPON STEEL & SUMIKIN Kyudo Club for this great support. Kyudo training in Thailand is now raised to another level. We will take good care of all the equipment and use it well to promote and support everyone who would like to learn and practice Kyudo in Thailand.